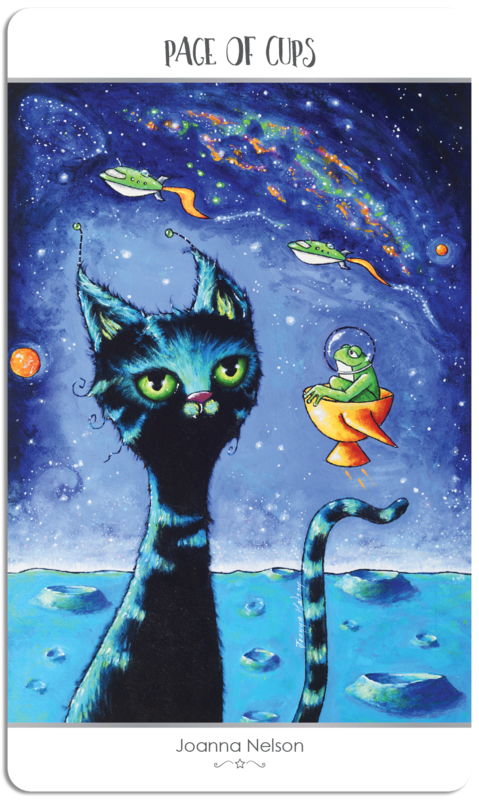 A space kitty sits alone on a quiet crater filled planet, and as stars light up the night sky, the sound of ships can be heard flying overhead. All of a sudden another sound… more quiet then the ships… something is approaching! A flying golden cup appears! To the cat’s surprise, up pops a messenger of sorts which, unexpectedly seems to be speaking to the space kitty, bringing a feeling of inspiration. When this card appears in a reading, it is advising you to embrace your inner child and get back to the sentimentality of youth, before life got in the way and brought cynicism to your soul. Don’t just listen to your heart, but let it run away with you! Embrace an opportunity to see the world in all its beauty, wonder at the shape of a cloud and let your imagination take over for a short while. Find time to appreciate life as a miracle that pulls at your heartstrings and fills your eyes with tears. Enjoy the chance to truly feel, without worries and lists of endless chores pulling you away. Do something fun that makes you laugh until you cry! Shake free of the restrictions and detachment that come with adulthood. The Page of Cups can represent a young person currently in your life, or someone young at heart who is coming into your life soon. Someone who brings you opportunities for love and emotion, who moves you and encourages you to get out in nature and go with your gut. To accept your sensitivity and appreciate your feelings, experience the world with your heart open to each and every emotion that it provokes. But be aware that with heightened emotion, and an open heart, you’re in a position to feel more pain, too. This entry was posted in Artist, Deck Review, Featured Card of the Day, General Tarot, Readings and tagged 78 Tarot, Astral, Page of Cups, Tarot.